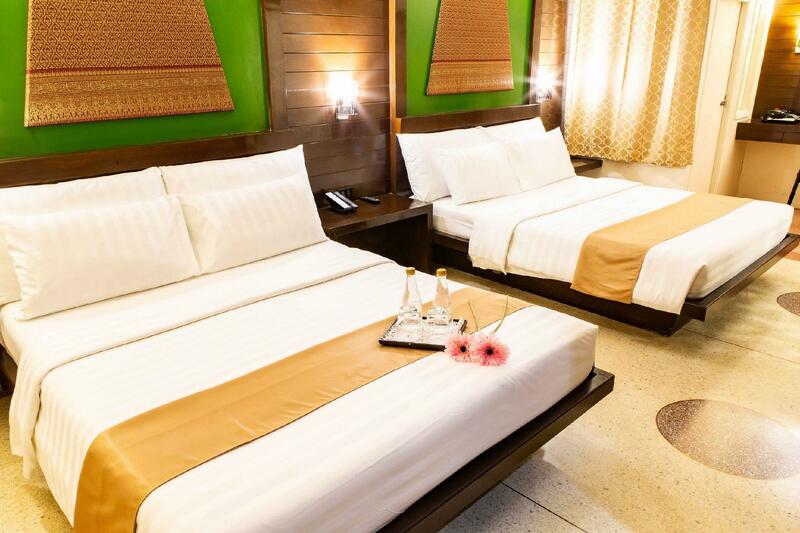 "On other way the pool area is great and the location is incr..."
Have a question for D&D Inn Khaosan? "You get what you pay for and a little more, great people, great location." "Cheap, cheerful and very reasonable priced for a one night i..."
The D&D Inn is a great choice for the ultimate getaway. 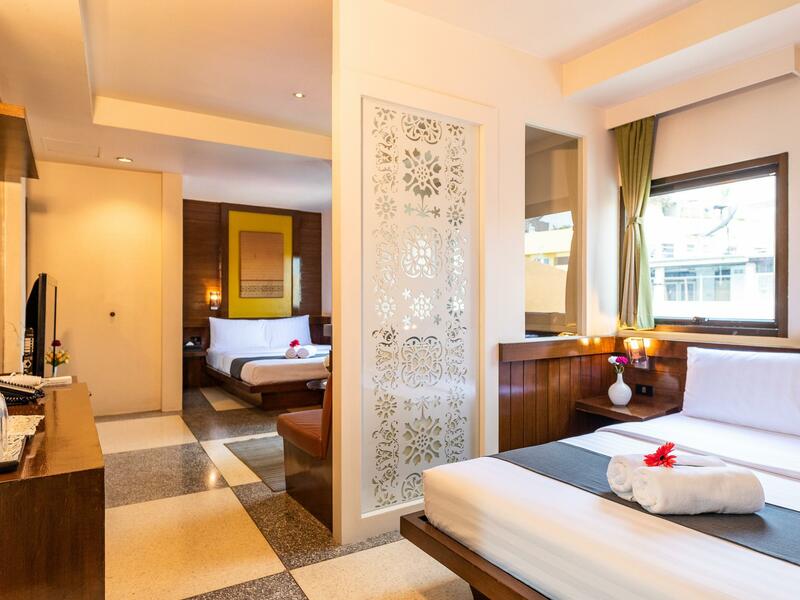 Conveniently located in the center of Bangkok, this hotel is the perfect place to stay if you want to explore everything there is to do here. It features a garden, a spa, and an outdoor swimming pool, among other great facilities. The D&D Inn offers street and courtyard views from its rooms, so you are bound to be peeking out at lovely scenery. It has various convenient features, such as safety deposit boxes, a salon, a currency exchange, and shops. From a bar to room service, the D&D Inn has a range of dining and snacking choices. 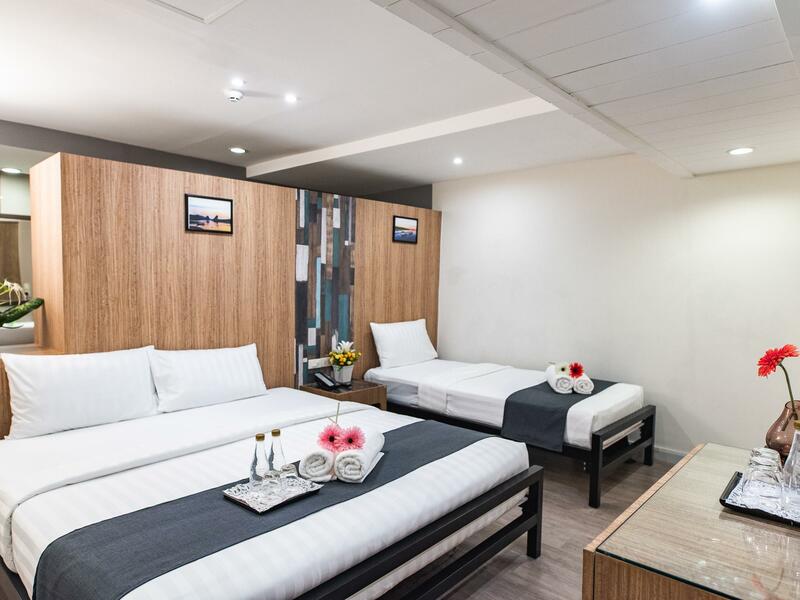 This hotel provides a range of useful services, which include a concierge, dry cleaning services, and daily housekeeping. With the wonderful massages available, you can relax and indulge in some pampering. Offering tours of the area, the D&D Inn is the perfect place to stay to learn about your surroundings and see everything you can while you're here. 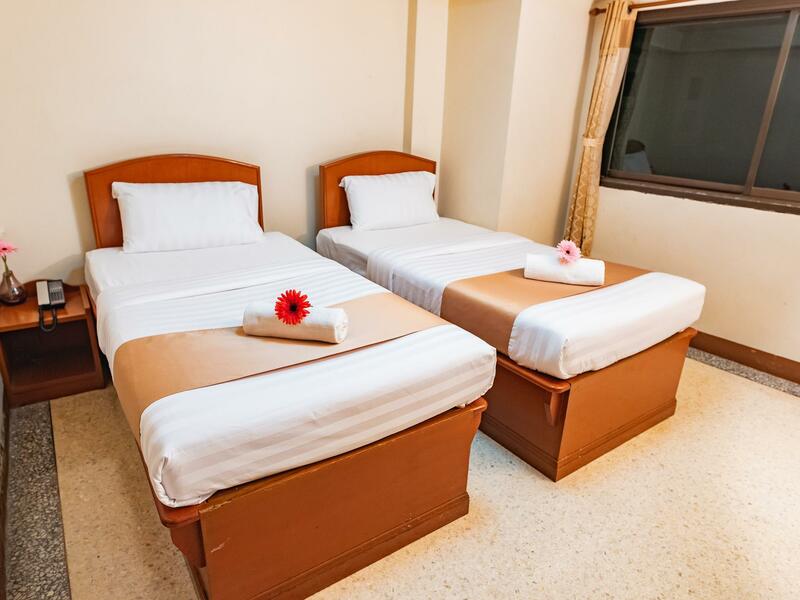 Equipped with family rooms, the D&D Inn has adequate space for your whole family to have a good time together. The hotel is pet-friendly, so you won't have to worry about finding a pet sitter while you're out of town. Check-in is offered from 02:00 PM and check-out is until 12:00 PM. The front desk is open around the clock, so there is always a member of staff behind the desk to assist you. There's free Wi-Fi in all rooms, as well as Wi-Fi in common areas, so visitors won't have to spend money on purchasing a local sim card. Hua Lamphong MRT Station is 3.0 km away and Hua Lamphong Railway Station is 3.1 km away. The nearest airports are Don Mueang International Airport (DMK) and Suvarnabhumi International Airport (BKK), which are 20.7 km and 28.6 km away. "We used this hotel few times & was great!" Staff friendly and prompt. Location central to all activities. Noice is supper loud as if walking in "nite clubs" in the street. Pick a room as high and further from the shop front as possible to ensure good sleep. D&D has the ambiance of a budget hotel. The price was very affordable and I was VERY comfortable with my room. I opted for a room thats not too noisy because "OH BOY" the ground floor was party central. My room didnt had any windows which has kind of good because it kept the noise out. The top floor had the pool which looks "posh" when i say 2 worlds collide it means on the ground floor its party central on the top floor it was chill vill. I love it. The rooms are insanely small (the updated ones) and the older rooms have the hardest beds I’ve ever felt in my life. The roof top pool however is NEXT LEVEL amazing. Perfect temp, large, clean, great bar with tasty drinks! My advice is stay at their sister hotel Dang Derm across the street and use D & D’s pool. Perfect combination! 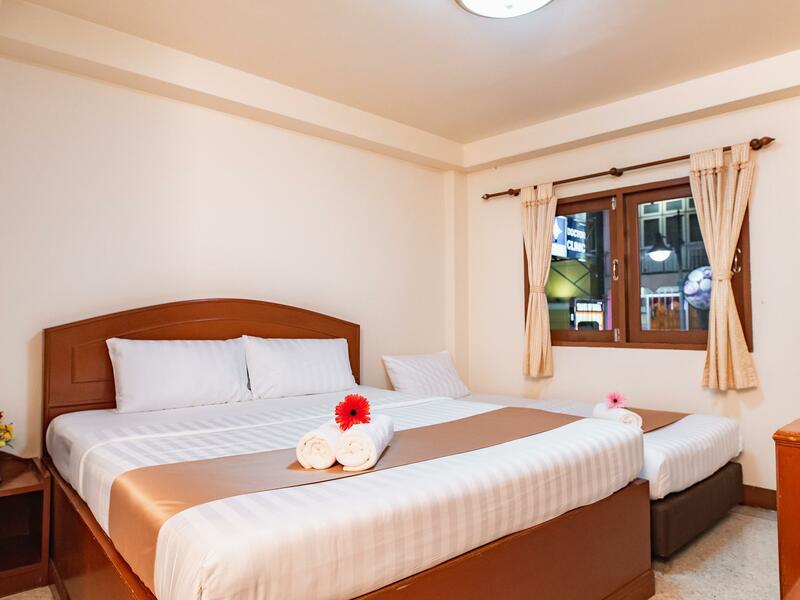 Very good location at the middle of Khaosan Road. It can be seen once you walk into Khaosan road. Nice and clean decoration. 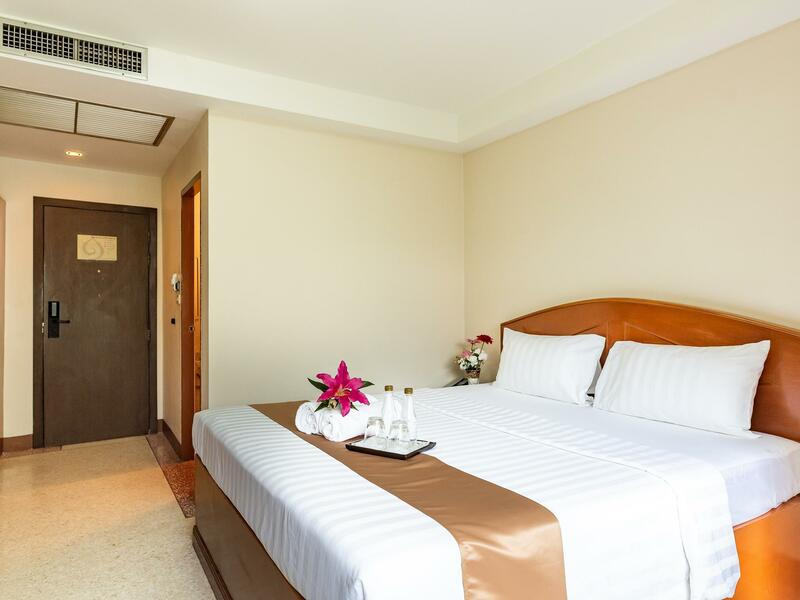 At great value, it offers everything needed for a traveler at great comfort. Bed quality is very comfortable for good rest after bar crawling night. Unexpected quality with great value for money. The staffs are friendly and warm to guests. It is a popular choice of accommodation! Where do I begin. The check in was unbelievably long. Located on a huge party street. Our taxi couldn't get down to drop us off due to the people and we ended up being dropped off at the end of the street and had to walk through the craziness to get to the hotel. The music from the street is so loud, the room shakes. So don't expect to beable to sleep until after 4am. The room was dingy, filthy and smelled horrible. of the two rooms we booked, there was blood on the sheets in one and a layer of grim on the floor in the other. Don't take your shoes off and bring your own bedding if you decide to stay here. The hallways to the rooms were one person wide and not air-conditioned. The only good thing about the hotel was the roof top pool area. It was busy and didn't have any shaded areas, but it was exactly as advertised and was very clean. The bar/restaurant at the pool was very nice as well. Senang, menikmati suasana yg berbeda.. Great location.. Luv it..
in the center of Khaosan Rd. food, drink, and 7-11 are all in 3 minutes. room is not very new but ok to use. Lovely swimming pool at night. Cheap. 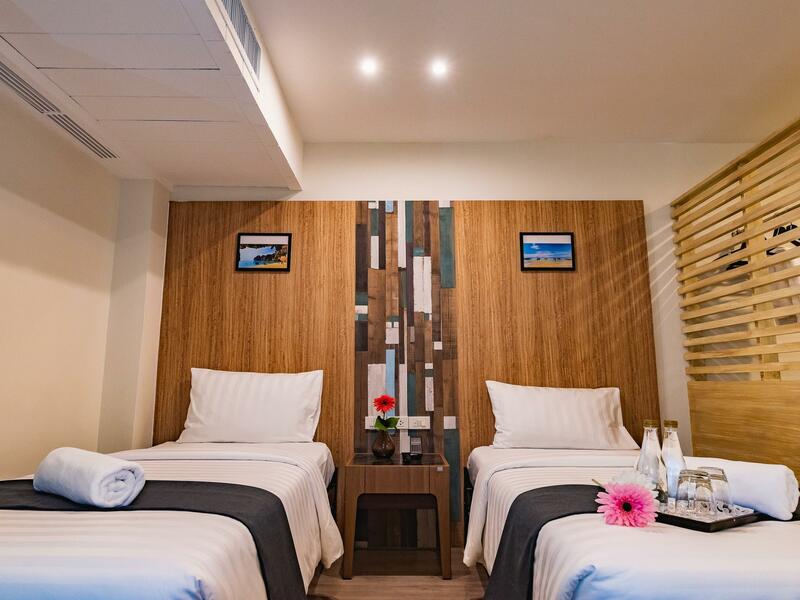 Good location, clean and modern room. 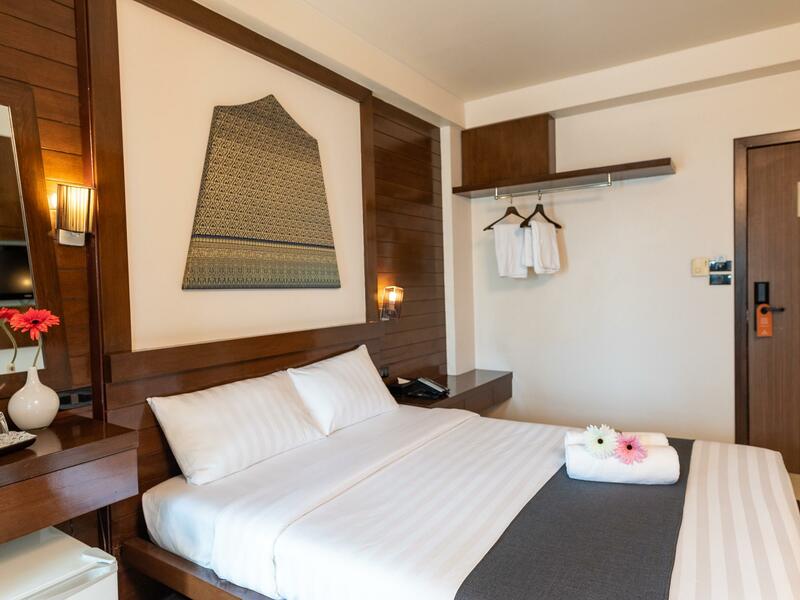 Housekeeping are a little ignorant which is unusual for Thailand. A few minor inconvenciences but overall a great stay. 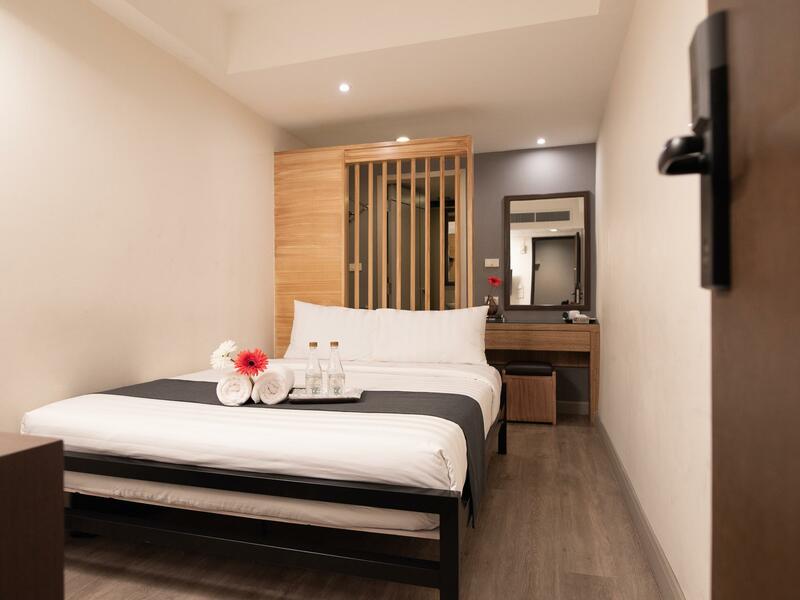 Construction work was a little noisy, it took a long time to check in and check out and the keycard had to be recharged a few times but the location was great, staff were nice, the price was good and the rooftop pool was a cool place to hangout and the room was fine. 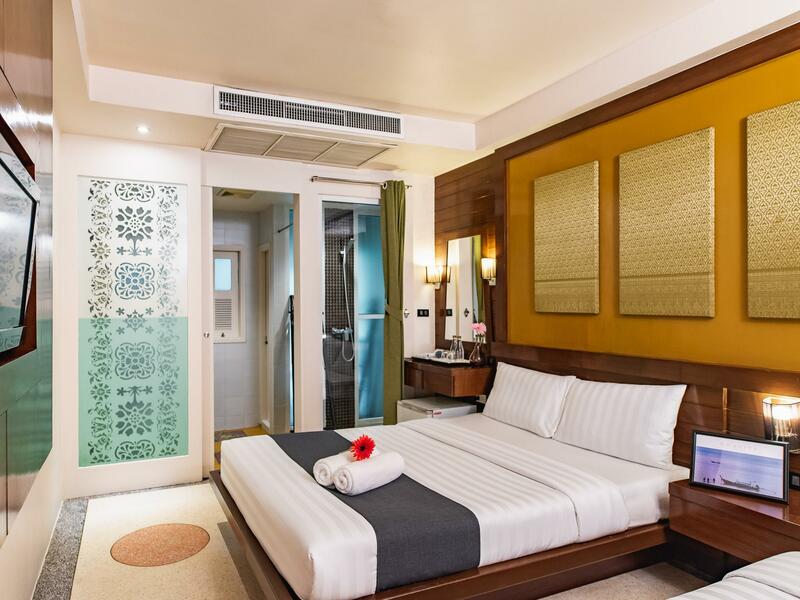 I booked 2 different type of room,-- one with balcony which is hardly can stand and water is propping from the sealing makes the smell of fungus for enter room maybe cause of it's door can not close. I paid extra for balcony space but you can not stand. Sealing light did not work in the room. what a horrible danging that was. and I paid £5 more for it. I had complaint but nothing happened. Other room face to street which is almost bigger even cheaper but electric wire were exposed and worst thing was from 10pm to 2am, it is incredibly noisy. The noise is beyond your imagination. It it was a torture. It was impossible to stay even ear plugs they provided obviously. Avid the room face to street if you plan to stay between 10pm to 2am. and do not use electric appliances. Avoid the room with balcony. I never fined such bad luck next each other in same hotel. Avid the hotel what ever! You only can tell if you know better and is is the worst I had staled in my life. My stayed 5day, before I checked in until i checked out the cleaner never clean the toilet! Never change the glass, the bulky of hair from previous Hari in toilet from previous guest until I checked out also never clean out, and the bulky of hair stick on my hair. I have made complaint to receptionist but the same! Washbasin never clean up the stain is there, toilet bow.. haih... Owner must maintain the facilities, because my room on 6th floor and quite new design n it's nice design but if u dun maintain the cleanliness, the facilities won't last!! Swimming pool very impressive, not recommended for family traveller as music really loud until 2am. The hotel is in the middle of Kao San = VERY loud parties till midnight. If you are here to party, that's not a problem though. Apart from that, the room is basic, maybe a little dusty, with a bit noisy AC. The roof pool is great, there is a bar next to it which means you can party even more at the pool. the location is nice. very accessible to nice spots in bangkok. we also loved the staff personnel because we can easily speak with them and they were very accomodating. the breakfast is enough. not so much to crave for the next morning but i must say it is satisfactory. pool area could have been nicer if they provide towels and if theres sauna at the side. what i wanna reiterate is the fact that they dont allow visitors to go inside the rooms. only the people who registered can go inside and we really appreciate that. we felt safe and confortable for that matter. in general, it is fine. If you want to party, drink, eat food, and massage dnd hotel is the perfect place..
Great staff. Really quite for the location. Other than that, the bathroom got flooded when showering. No natural light. Small roaches in the room every day. Keep in mind you are on a party street so if you don’t want loud music at night til 130am every night this place isn’t for you. If you are about the night life get out there and see some of the wicked fun!